Not only are you getting 20 posts from me this month but you’re getting 20 awful headlines. 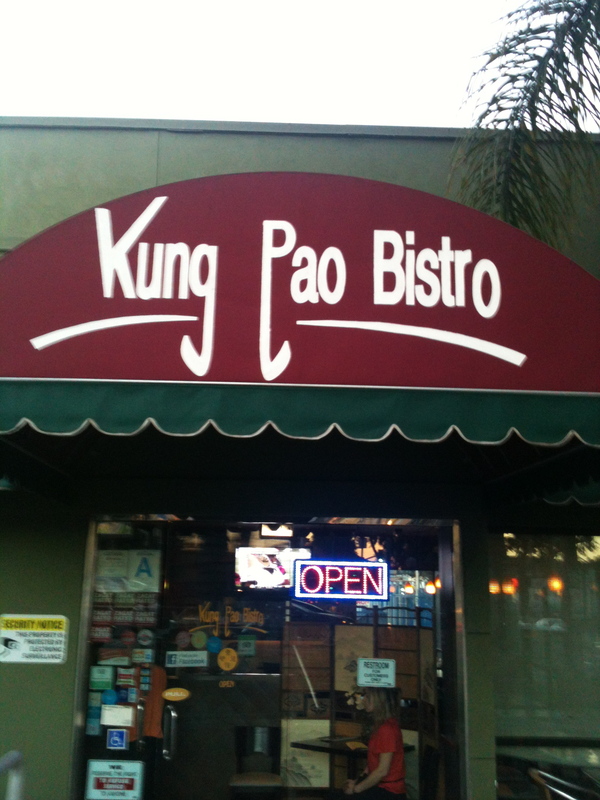 But we did have a feast at Kung Pao Bistro. I had never been there before but have heard a lot about it for a while. It’s a meat-serving place but they have a whole vegan page on their menu. Overall, I’d say it was a mixed bag but I’d certainly be willing to go back and try more things. 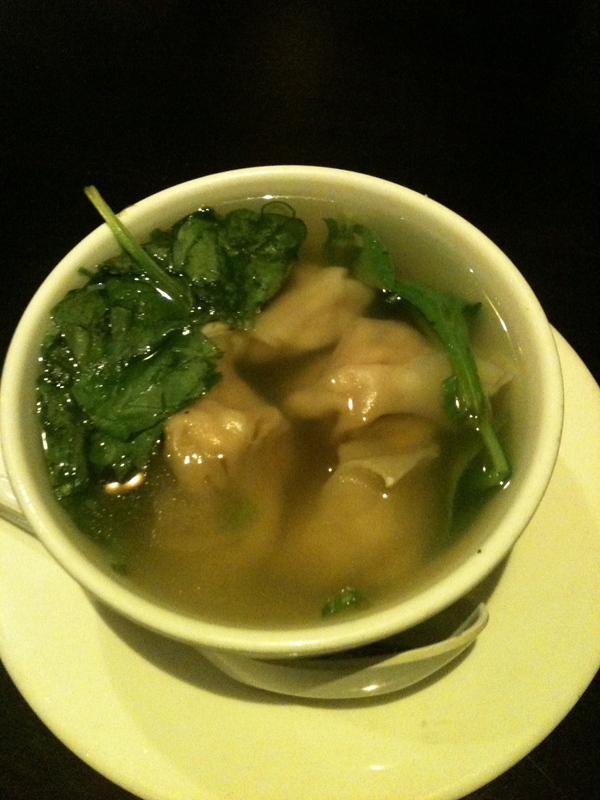 My favorite item by far was the vegan chicken and spinach wonton soup. The soup was delicious and so were the dumplings. And we got it at a happy hour discount price to boot. (4pm to 7pm). The beef and broccoli had what tasted like VegeUSA fake beef. It was a little too sweet for me but the broccoli was very good. 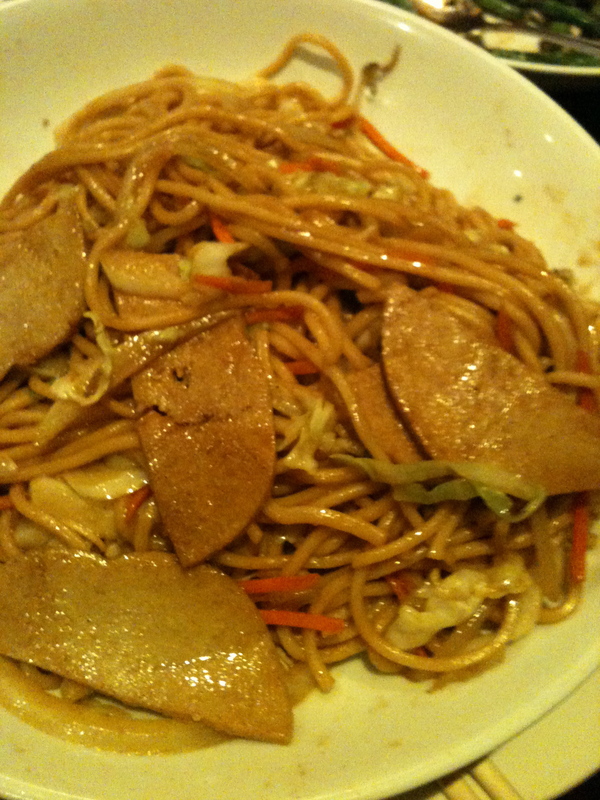 The vegan chicken lo mein wasn’t that great. The fake chicken was these weird crescent-shaped slices, and the noodles weren’t that great either. 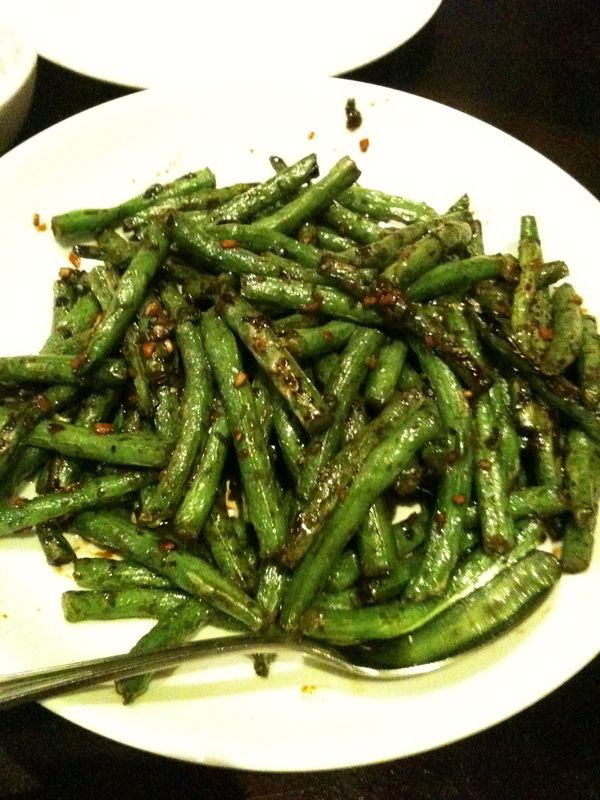 The sauteed garlic string beans were very good. I will definitely be back to continue working my way through their vegan menu. A week ago, the LA Weekly ran a piece about the “10 Best Vegan-Friendly Restaurants in L.A.” Number nine was “Happy Family Vegetarian Restaurant.” Good timing, since I had plans to go there two days later. The article says, “Eggs may pop up here and there, so it’s advisable to check with the staff before ordering.” Because of that I checked with the staff, who told me there is no egg in anything. 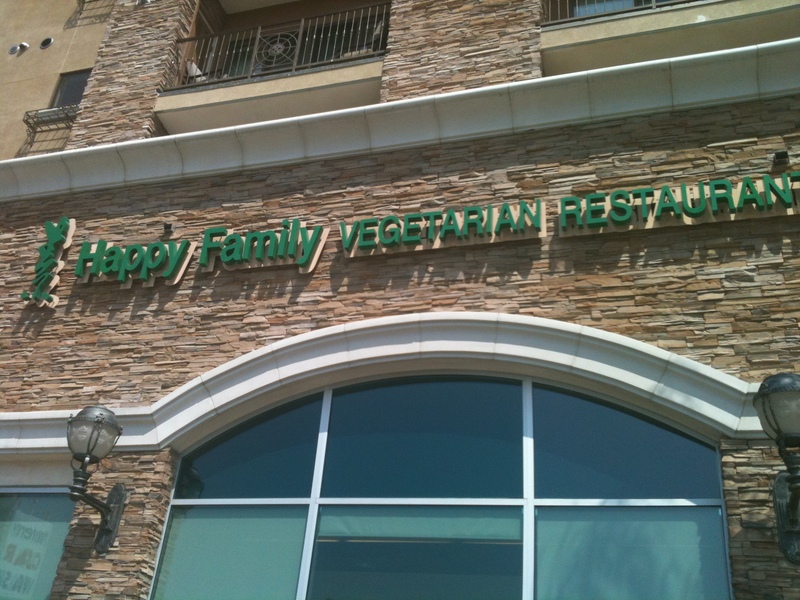 So apparently it’s really “Happy Family Vegan Restaurant” — but why scare people even more, I suppose. Happy Family is in a crazy mall called Atlantic Times Square that is kind of like The Grove on ginseng. It’s a mix of commercial and residential space and it’s got one of the crappier underground parking garages I’ve ever been in. Snap a pic to remember where you parked. Trust me. And I’m not a get lost in a parking garage person. Happy Family offers an All You Can Eat menu. It’s $13.95 for adults and $8.95 for kids. You get one spring roll and one “Minced Squab in Lettuce” and then a crazy amount of food. The spring roll is tasty and the Minced Squab — which is pretty much a PF Changy lettuce cup — is very tasty. As for the rest of the food, I took a lot of pictures so I’ll just roll through them and tell you what I thought of these dishes. 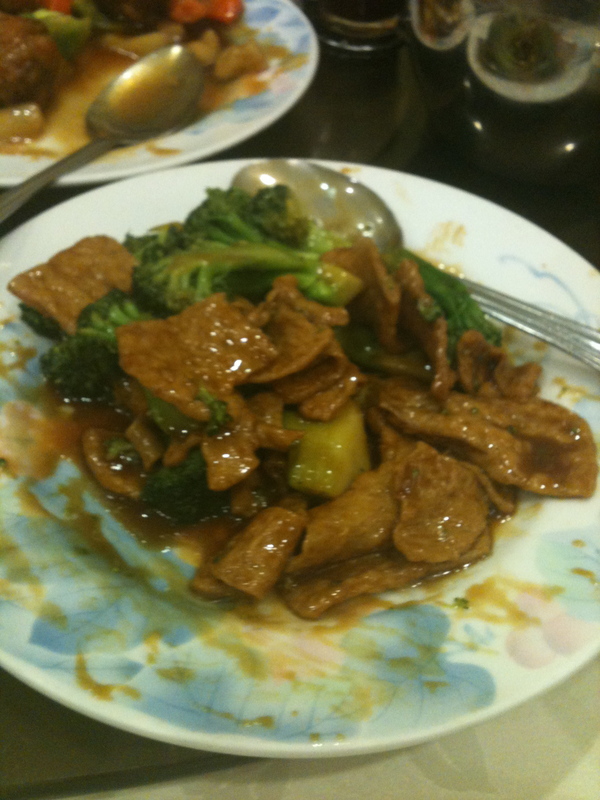 The “Vegetarian Sliced Pork with Broccoli” was the best dish I had. 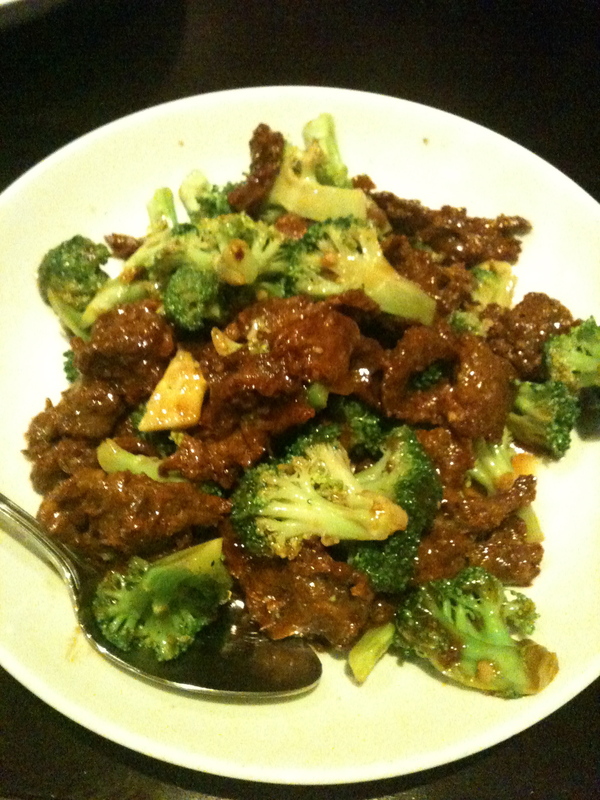 I don’t know why this is considered pork with broccoli and not the more common beef with broccoli, especially since the soy in this dish seems more intended to mimic beef not pork, and does an impressive job of it. The fake beef, sorry pork, has a pretty similar texture to the real thing and perfectly takes on the taste of the sauce. I’m not saying I need my soy to act like it’s meat, but since that seems to be the goal of this restaurant, they succeed as far as this dish goes. 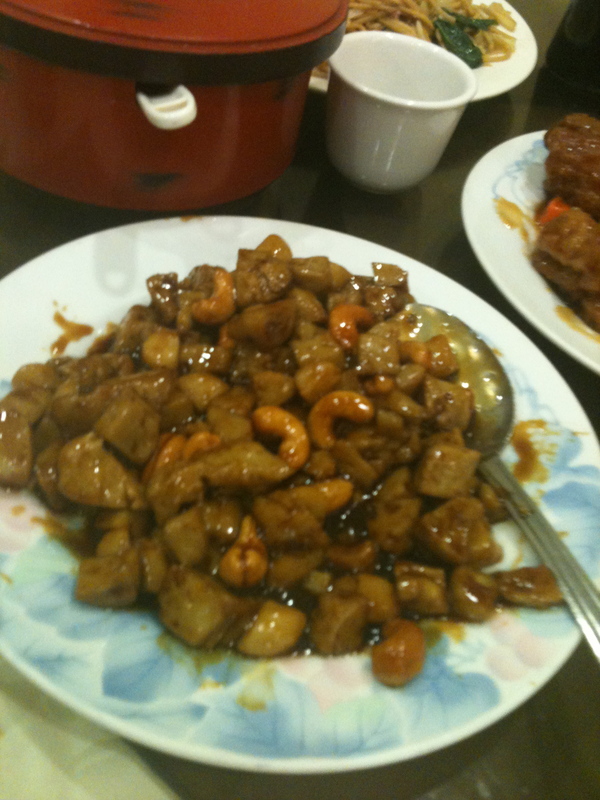 The fake chicken with cashew nuts was good, too, though not as good as the fake beef with broccoli. And now that I see the menu says the fake diced chicken here is wheat gluten, I suppose it’s possible the fake beef in the fake sliced pork with broccoli is also made of wheat gluten. But it didn’t say, so I don’t know. The fake chicken in this dish was a little bit rubbery but I liked it, and I don’t usually like rubbery food, at least not as far as I know. Maybe it’s fake rubber. 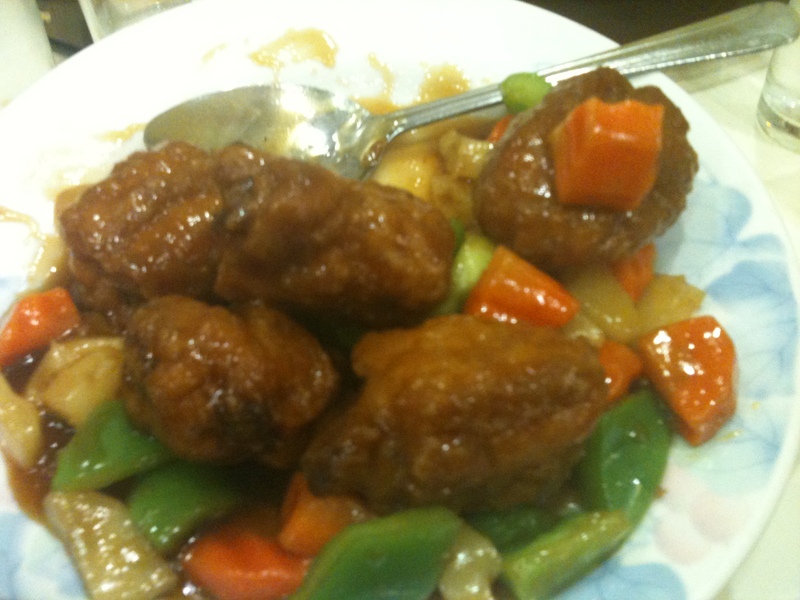 The “Vegetarian Rib (Taro) with Sweet & Sour Sauce” wasn’t so good. It was basically a soft, gushy mess that was more zeppole than rib. 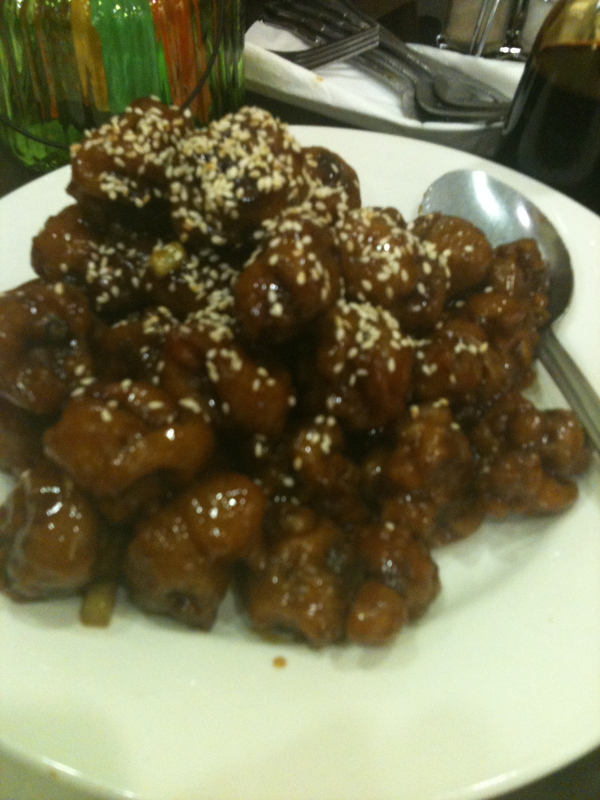 The fake sesame chicken also suffered from zeppoleosis. In fact, I didn’t realize it was made of mushroom until I looked at the menu. 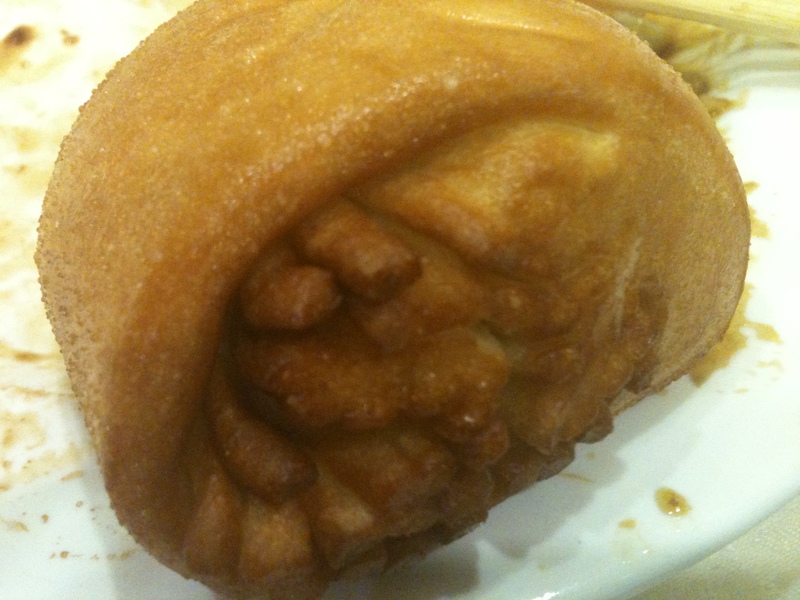 It was soft and doughy inside, and when food is like that, it seems more like dessert to me than a main course. I’m not sure which dish this is. I asked the waitress what her favorite dish on the menu is and she said “shredded pork” and brought me this and it was good. But when I look at the menu I can’t figure out which one it is. 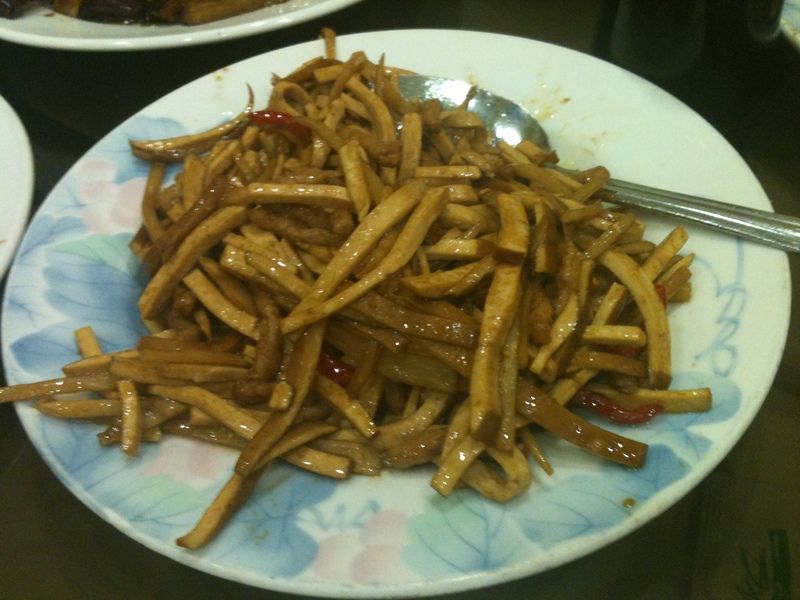 Maybe shredded pork with bean curd? Whatever it is, it tastes better than it looks. 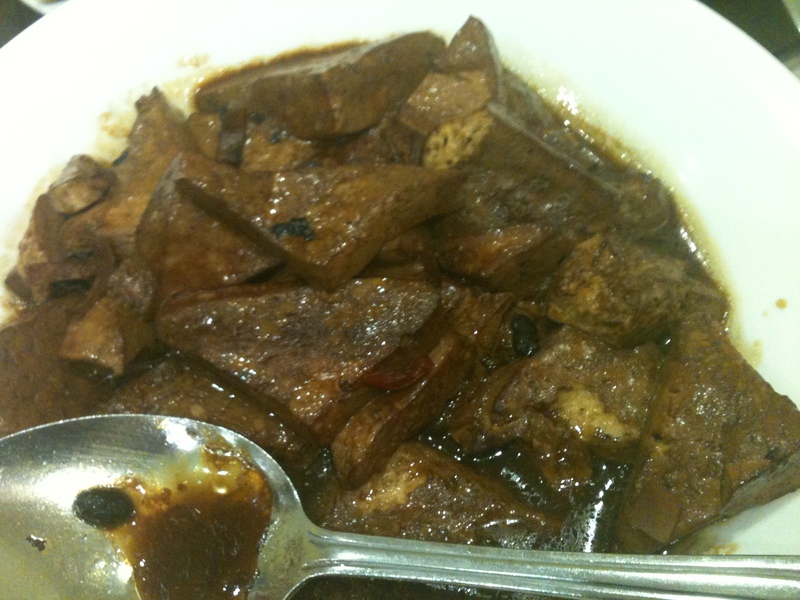 The “House Tofu with Black Bean & Brown Sauce” was one of my favorite items. Part of what I liked was that it wasn’t trying to be a fake meat, though don’t get me wrong I can enjoy fake meats with the best of ’em. Sometimes tofu like this can be limp or soggy but this was just the right amount of softness without falling apart when you picked it up. Oh, and it was tasty. 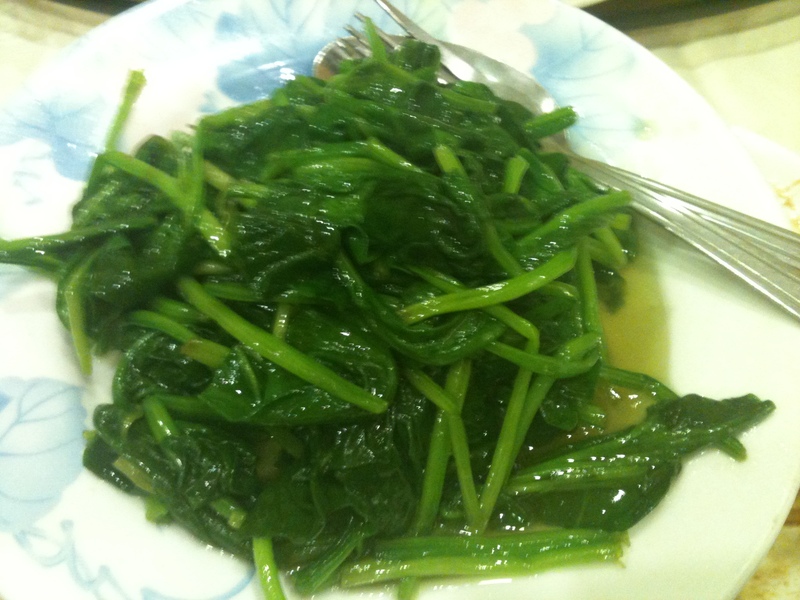 Not too much to say about the “Stir Fry Spinach” except that it was simple and very good. 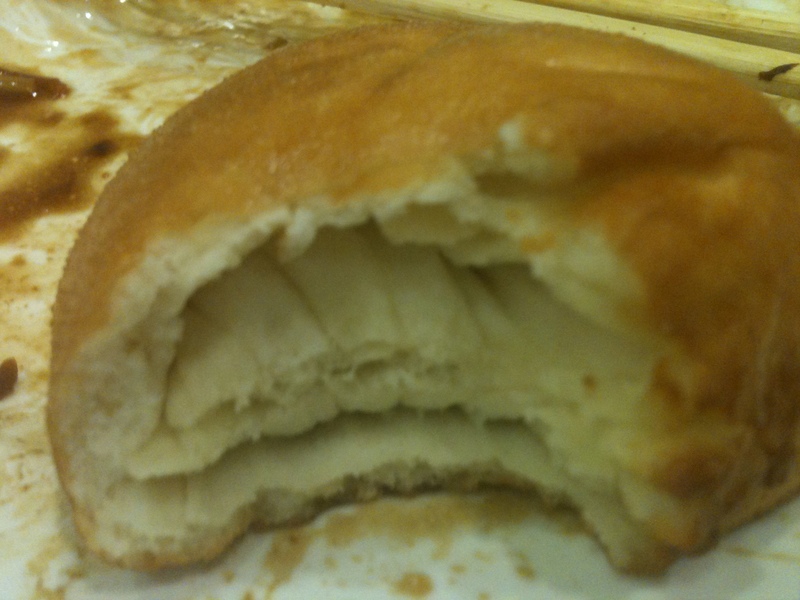 When it arrived, she said it was “fried bread.” Okay, those are two good words to put together, right? But when I took a bite, well, yup, it tasted like a zeppole. Which wasn’t so bad since I’m guessing it’s supposed to taste like a zeppole. 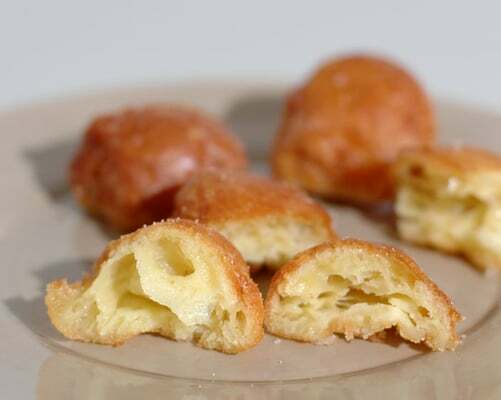 In fact, zeppoles are definitely in the fried bread frylum. But there’s only so much fried bread someone needs. Especially in a Chinese restaurant. 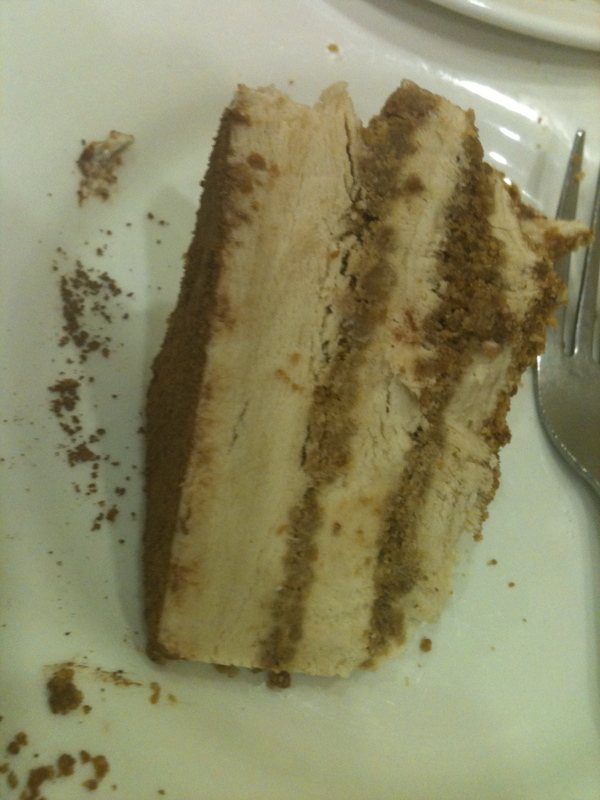 For dessert I had the tiramisu cake. There was a big problem with this. No, it didn’t taste like a zeppole. But when it was first served it was clear it had just come out of the freezer. It had the crystally texture that an old container of ice cream can get. Or an old container of Almond Dream. (One of the great things about going vegan is that you don’t have to give up that awful crystally freezer taste.) Once the tiramisu cake hit room temp it wasn’t bad but by then it was kinda ruined for me, like a movie after a cellphone ring. Oh well. 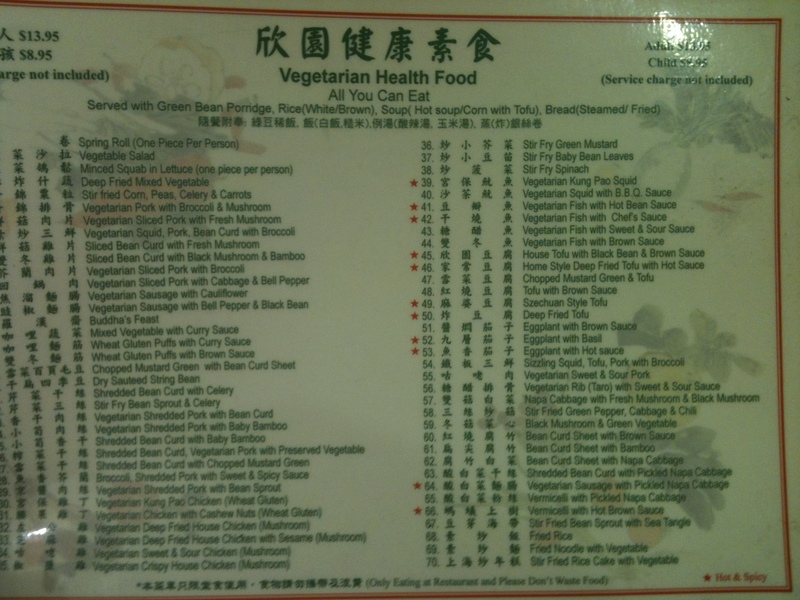 All in all I’d say that if you’re vegan or vegetarian and like Chinese food and ampersands, this is the place for you. Just leave a trail of (fried) bread crumbs so you can find your car afterwards. *Linking to a Doobie Brothers video does not imply approval.